Changing from a cool-season annual like oats to a warm-season annual like sorghum-sudangrass may provide more available forage. The author is a soils and crops consultant with the Noble Research Institute, Ardmore, Okla.
Let me take some time to address this. Like it or not, change is inevitable. Markets, input choices and prices, interest rates, farm programs and policies, labor resources, equipment, technology, weather patterns, soil fertility levels, varieties, and pests all change. So, why are we still growing what we have always grown? One reason is because we know how to grow it. Another reason is because most of us, including myself, don’t like change. Change is hard. It gets us out of our comfort zone. Even if we aren’t completely comfortable growing what we currently grow, it may seem better than the thought of making a change. There is often uncertainty and perceived risk with making a change, and as with anything new, there will be a learning curve to address. It is probably easiest to make a change if you are growing annual forages. One of the easiest changes may be switching from wheat, a popular forage in the Southern Great Plains, to another small grain such as barley, oats, rye, or triticale. Depending on your goals and resources, one of these may be more agronomically and economically productive. Animal gains per pound of forage should be similar, but production of an alternative forage may outpace that of wheat. 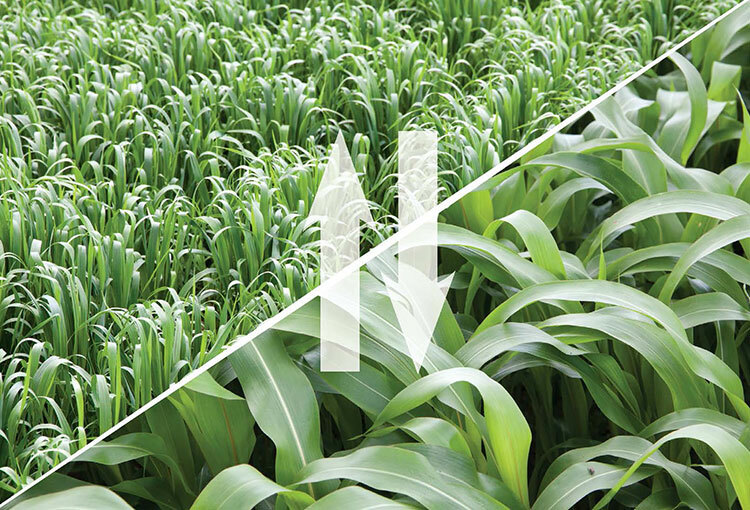 Similar changes may be possible in other parts of the country with other forages, such as switching from corn silage to a sorghum species silage. Another switch may be from a cool-season annual forage to a warm-season annual forage. I work with many producers who need fall forage for stocker cattle. Historically, they have planted small grains in September and hoped for pasture by Thanksgiving. Now, they are successfully experimenting with warm-season annual forages planted in the summer. We recently measured production on one of these pastures planted on August 24, 2017; it had 6,166 pounds of dry matter forage per acre on October 26, 2017. Many small grain fields in this area do not make that much forage all winter. In fact, I work with several producers who now grow cover crops of multiple annual forage species in the summer between winter wheat pasture crops. They are having problems terminating forage that is 10 feet tall and in excess of 12,000 pounds per acre of dry matter production to get their winter pasture planted. Will the winter pasture produce that much forage? Maybe, but probably not. Another change producers should look at is annual versus perennial forage. Would it be a better choice to allocate the dollars spent producing annual forage to enhance the yield of an existing perennial forage? Oftentimes, the answer is yes. In the Southern Great Plains, producers often raise a sudangrass crop for additional hay but do not address an existing low-producing bermudagrass field. Should the cost of sudangrass seed and planting be spent to boost soil fertility and subsequent production of the bermudagrass? The answer is “it depends,” but oftentimes we don’t even ask the question. Again, similar comparisons can be made in other parts of the country. My recommendation is to spend some time now to evaluate what forage you are growing. Think about your goals today and all the factors affecting your forage production that have changed since the last time you set goals. This article appeared in the March 2018 issue of Hay & Forage Grower on page 24.